Shastra Seema Bal (SSB) will release the SSB Answer Key 2018 at www.ssbrectt.gov.in. After the conduction of the exam, the candidates who will appear in the exam will able to check the answer key. SSB will release the answer key after 02 days of conduction of the exam. Candidates who will appear in the exam will able to object the answers till 07 days form the exam day. After 15 days of the exam, SSB will release the OMR sheet and purified answer key. All of the processes will be conducted online. Apart from online no other mode will be introduced by the recruitment body. The candidates may have to enter the login credentials for downloading the SSB Answer Key 2018. Get here all the details on SSB Answer Key 2018 like process of downloading the answer key, schedule of releasing answer key. Answer Key: The candidates will be able to download the answer key from www.ssbrectt.gov.in. How To Download SSB Answer Key 2018? After conduction of the written exam, The appeared candidates can check the answer key. They have to download the answer key. To download the answer key properly, kindly follow the steps provided below. First of all click on the above link, which will be activated when SSB will release the answer key. SSB will release the answer key through pdf hence candidates don’t have the enter any credentials on the official website. Now download the answer key and check it with your OMR sheet. 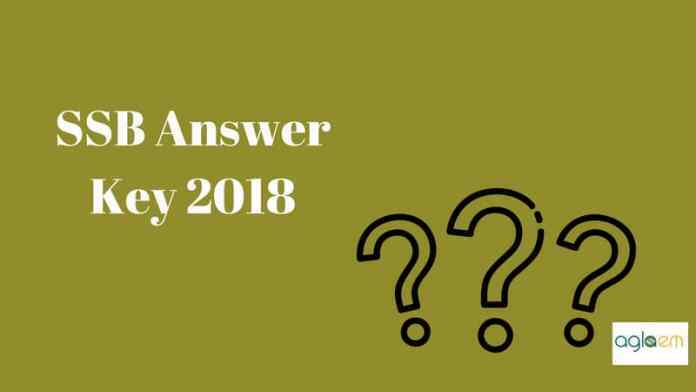 How To Use SSB Answer Key 2018? After downloading the answer key candidates should have the knowledge of using it. To do so knowledge of marking scheme is the must. The candidates should note that SSB will release the answer key for only written examination for the objective one i. e. Paper I. For each correct answer, candidates will be awarded 01 marks. Till now the advertisement doesn’t contain any information about the negative marking. After conduction of the exam and releasing of answer key, SSB will declare the result the for the written exam. As there are three phases in the selection process, hence the recruitment body will release the result for each phase separately. Candidates might have to enter the login credentials for checking their result. At last when all the process of recruitment will over SSB will release the final merit lits. The selected candidates have to appear for the medical examination.